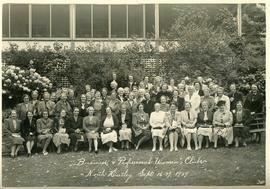 The item is a photograph of the women in attendance at the regional convention of the Business and Professional Women's Clubs in North Hatley on 16 and 17 September 1939. The fonds contains primary source information on the theatre productions of the Brae Manor Players in Knowlton and North Hatley from 1939 to 1955. If consists of programmes. 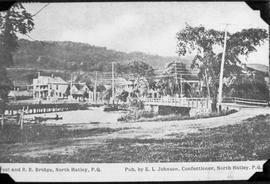 Item is a photograph of the railway and foot bridge with the town of North Hatley directly behind it. Item is a postcard of the town of North Hatley looking west. Item is a photograph of Lake Massawippi with the town of North Hatley and the bridge located in the background. People are visible on the shoreline . Item is a photograph, probably taken in the 1890s or 1900s, with a view of the steamer Lady on the Lake on Lake Massawippi. View on Massaweppi lake, North Hatley, P.Q. Skiing at Hovey Manor, North Hatley, P.Q. Lake Massawippi, North Hatley, Que. Lake Massawippi from Golf Links, North Hatley, Que. W. S. Davidson Home, North Hatley, Que. The item is a postcard showing the casino at Glen Villa Hotel in North Hatley from about 1906. Lake Massawippi, North Hatley, P.Q. The item is a postcard view of a sailboat on Lake Massawippi from about the 1910s. Starting, Regata Day on Lake Massawippi, North Hatley, P.Q. The item is a postcard with a view of canoes and sail boats on Lake Massawippi on Regata Day in North Hatley from 1907. View of the Harbor and the Boston & Maine Bridge, North Hatley, P.Q. The item is a postcard with view of North Hatley and Lake Massawippi from around the 1900s. The item is a postcard showing the public library in North Hatley from 1905. Regata day on Massawippi Lake, North Hatley, P.Q. The item is a postcard view of boats and people on regata day in North Hatley from around 1906. The Library, North Hatley, P.Q. The item is a postcard showing the public library in North Hatley from 1911. Foot and R.R. Bridge, North Hatley, P.Q. The item is a postcard with a view of North Hatley and Lake Massawippi from about 1907. View showing the Rustic bridge, North Hatley, P.Q. The item is a postcard with a view of a bridge and brook, probably near the Glenn Villa hotel, in North Hatley from about 1906. Glenvilla Creek, North Hatley, P.Q. The item is a postcard view of a creek by Glen Villa Hotel in North Hatley from around 1910. The item is a postcard view of Lakeside Road (presently Chemin du Lac) in North Hatley from 1906. The item is a postcard of the road near Glen Villa Hotel in North Hatley from 1906. The item is a postcard aerial view of North Hatley and Lake Massawippi from 1908. The item is a postcard view over Lake Massawippi from the Boston & Maine Railroad in North Hatley from about 1906. The item is a postcard view of the grounds from the Glen Villa Hotel, including horses, carriage and foot bridge, in North Hatley from 1909.